Social Office, delivered through Liferay Marketplace, is the fulfillment of our vision to empower our users to easily extend the capabilities of Liferay Portal. Liferay, Inc., provider of the world’s leading enterprise-class, open source portal, announced today the launch of Social Office 2.0 Enterprise Edition (EE), the newest version of Liferay’s social collaboration solution for enterprise teams. Social Office 2.0 EE, the newest app available in Liferay Marketplace, equips users with an efficient means to collaborate with teams in their business units and to build a social network within their enterprise. By downloading Social Office 2.0 EE from Liferay Marketplace, Liferay Portal users instantly gain access to a full social intranet that works alongside existing sites and the enterprise data and applications integrated into their Liferay Portal deployment. Social Office also works with Liferay Sync, which automatically synchronizes documents and makes them accessible across desktop and mobile environments. Business users benefit from advanced content management and collaboration features in Social Office 2.0 EE, including simple site creation, blogs, wikis, message boards, calendars, and task management. A breadth of social networking features, such as private messaging, activity tracking, and personal profiles, provide intuitive ways to connect and work together online. Enhanced Document Management – New document previews, document types and a revamped user interface make creating, editing and sharing documents easy, saving time and strengthening collaboration. Improved Contacts Center – Social Office users can use the Contacts Center to quickly find other people in the organization with specific areas of expertise or project experience. Notifications – Users now receive convenient alerts to new requests, messages or announcements through the notifications center on the dockbar. Microblogging – These status messages allow users to broadcast real-time updates to connections and followers and to see other users’ posts. Enhanced User Management – Liferay’s Control Panel allows for simple and intuitive management of Social Office users’ membership and roles. With the recent release of Liferay Marketplace, enterprise end users gained access to a library of over 70 enterprise apps and themes for download. Social Office 2.0 represents the first major product offering in this repository, showing the modularity and extensibility of the Liferay platform. Liferay Marketplace’s scope of offerings is expected to expand with the invitation to Liferay’s community of over 70,000 developers and users to create apps for download and eventually for purchase by Liferay platform users in Liferay Marketplace. 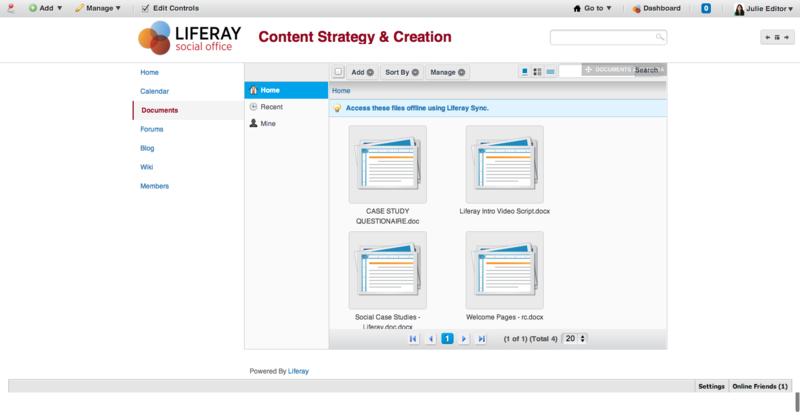 For more information about Social Office 2.0, visit http://www.liferay.com/products/liferay-social-office/features. Existing Liferay Portal EE users can download Social Office 2.0 EE from Liferay Marketplace or visit the download page at http://www.liferay.com/downloads/social-office/available-releases. For more information about Liferay, visit http://www.liferay.com.